Central Florida leaders recently joined the 2018 Downtown Hope Hike event hosted by the Orlando Health UF Cancer Center. Each year, hundreds of pink-clad patients, survivors and family members gather as a reminder of the importance of early breast cancer detection and treatment to support those who have been diagnosed or are currently undergoing treatment. This year’s event, held on Friday, Oct. 5, marks Orlando Health’s official kick-off to Breast Cancer Awareness Month. 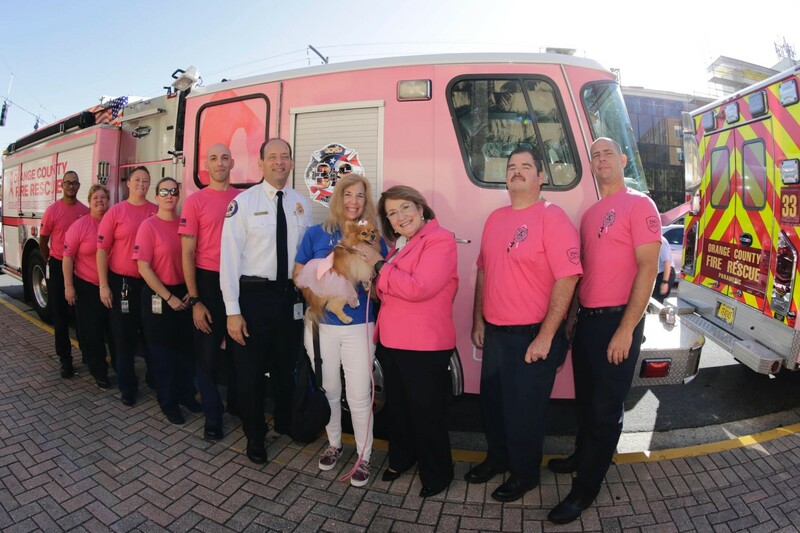 With much fanfare, first responders from Orange County Fire Rescue Department and Orlando Fire Department unveiled a custom, pink-wrapped rescue ambulance and fire engine. Orlando Police Department also unveiled a wrapped SUV. Orange County Mayor Teresa Jacobs joined other Central Florida leaders and Orlando Health physicians at the event to speak about the importance of having a strong support system for patients. Mayor Jacobs also presented a proclamation recognizing Oct. 5, 2018, as Breast Cancer Awareness Day in Orange County. It is estimated that one in eight women in the U.S. will be diagnosed with breast cancer. Through Orange County Government’s Wellness for Life Plan, employees have access to many breast cancer, and other health-related resources, including information sessions, wellness expos and mobile worksite mammogram screenings.